​Printmaking has long been one of my favorite forms of art. I was drawn to linocut reduction printing in particular because I enjoyed the methodical, algorithmic nature of the process. It is also exciting to have an image in my mind and then watch it slowly unfold layer after layer. When selecting subject matter for my prints, my choices are straightforward. Quite simply, I create what I like. In the case of the “Retro Owl,” which was inspired by old Halloween decorations, I express my enjoyment of nature, fall holidays, and all things vintage. ​Stephanie Zwyghuizen lives in Jamestown with her husband and their shelter cats. 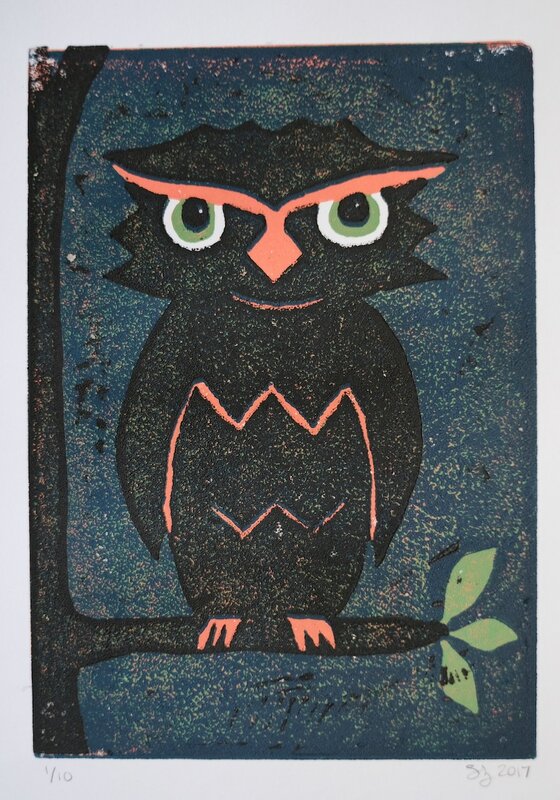 ​Retro Owl; Linocut reduction print; 5" x 7"